"Welcome to the madhouse, Batman! "In Batman: Arkham Asylum, the game title that jumpstarted the critically acclaimed Batman: Arkham game series, Batman must do all it takes to stop The Joker's elaborate plot to destroy Gotham City with the terrifying TITAN drug! 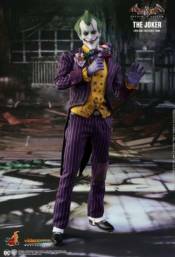 As the game's main antagonist and mastermind of the evil plan, The Joker is menacing yet captivated many fans' "love" for this maniacal Clown Prince of Crime!The collectible figure is expertly crafted based on the appearance of The Joker in the game. It features a newly sculpted head sculpt with Joker's iconic grin on his face, newly developed body, skillfully tailored costume, a number of detailed weapons and accessories including a pistol, injection gun, chattering teeth explosive, and a figure stand with specially designed backdrop.